Most photographers have several pro-bono projects at any given time. They are usually projects that involve people and organizations that already have an established relationship with the photographer, so asking someone, who is unfamiliar with you or your organization for pro-bono work, will typically not be successful, no matter how good your mission is. And a small word of advice: offering a trade out for a small photo credit is considered unprofessional. Now that you have found some money in your budget for photography, how do you find a good photographer? If there are other non-profits in your area that use good photography, ask them whom they use. You can also find out what kind of budget they worked with and what their experience was working with the photographer. If you don’t have anyone to ask there are several ways to find good photographers in your area: one is to look through local magazines and newspapers at the bylines for photographs and contact the publication for contact information. There are also professional photography organizations that can link you to photographers in your area. One that I recommend is ASMP—The American Society of Media Photographers. The first link at the top of their page is “Find a Photographer” where they list photographers and their websites. You can look through these and find a photographer whose style appeals to you for your project. Another good resource is the NPPA—The National Press Photographers Association, which has a link on their home page to Find a Visual Journalist. Some of my favorite clients are independent schools and colleges where I document the life of schools, entering classrooms, laboratories and dorms and documenting the educational system in bloom. I always leave with great hope for our future. 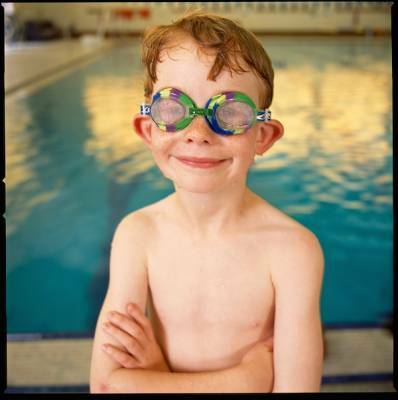 This is a photograph of George that I took at the Lovett School pool. It has always been one of my favorites. Billy Howard has traveled the world documenting people and places for a diverse range of clients including nonprofits. He is the author of Epitaphs for the Living: Words and Images in the Time of AIDS and many other books. He is a 2011-2012 Rosalynn Carter Fellow in Mental Health Journalism. Find out more at www.billyhoward.com. All photos courtesy Billy Howard.